JNN 27 May 2014 Lucknow : Narendra Modi, who was sworn in later Monday as India’s 15th prime minister, the ceremony which was even attended by his Pakistani Counterpart PM Nawaz Shariff, In his first statement to the Public , expressed condolences to the families of the dead in a message on Twitter. “Prayers with the injured,” he said. As An express train plowed into a parked freight train in northern India on Monday, killing at least 40 people and reducing cars to heaps of torn and twisted metal, officials said. “It has been reduced to a mangled iron mesh,” he said. “We do not know how many people were there.” While the car seats 72, such trains are often filled beyond capacity. Authorities were searching for the station master, who disappeared after the accident in Sant Kabir Nagar, about 220 kilometers (140 miles) southeast of the state capital, Lucknow. But authorities said it was too early to say what had gone wrong and were investigating everything from mechanical failure to human error. The Gorakhpur Express passenger train was traveling at high speed and slammed on its brakes in an attempt to stop, but hit the train sitting on the tracks near a railway station in Uttar Pradesh state, district magistrate Bharat Lal said. Six of the cars on the express train derailed, with one car with unreserved seating taking the brunt of the impact and accounting for most of the 40 deaths so far counted, senior police officer Amrendra Sainger said. Villagers were the first to reach the scene after the accident about 10 kilometers (6 miles) from the nearest road. Indian TV broadcast images of them assisting the injured amid piles of strewn luggage. Most of the victims were poor farm workers returning to their homes from the neighboring state of Haryana, local police official Zameer Ahmad said. The train departed from Haryana’s Hissar town and was just 46 kilometers (29 miles) from its destination of Gorakhpur when the accident happened. Rescuers worked to free people trapped under toppled cars and debris. The express train’s driver died later Monday from serious injuries, while the assistant driver was in critical condition, railway official Alok Kumar said. Accidents are common on India’s railroad network, one of the world’s largest with 20 million people riding daily on about 11,000 passenger trains. Most accidents are blamed on poor maintenance and human error. Earlier this month, a train crashed into a jeep at an unmanned railroad crossing in Uttar Pradesh, killing 13 members of a wedding party. Four days earlier, a passenger train derailed, killing at least 19 people just south of Mumbai. Another train derailment last month left dozens injured in the northeast state of Assam. The Next Day Narendra Modi was sworn in as India’s PM , He had a 30-minute meeting with Nawaz Sharif, whose decision to come to Delhi and attend the ceremony , is being highly criticicised within Pakistan , as going to the oath taking ceremony of the Extremist Hindu Nationalist , who is not only critical of Pakistan but his handling of the Gujrat Massacare of Muslims ,for which he has never apologized , rather who have openly even given Bad remarks for Pakistan , as well as Nawaz Shariff himself , and in a condition like that , where both the Nuclear armed states are not on equal terms , then it is highly regrettable to accept the Indian Hegemony , as per the Plan of the US and its allies. The relationship, heavy with the weight of history, is in something of a stalemate as the two terms of India’s Congress-led government ran their course without making much progress. But after the Agra Diplomacy by the Musharaf , which had a Lot of Ice melted , and in the Back drop of same Scenario , the Indian Intelligence agencies Who staged Mumbai Attacks , to cap the Bottle of Diplomacy for a Bigger time and blaming it on Pakistan , added fuel to the mutual distrust felt between two nations that have gone to war on four occasions. Many in India believe the Hindu nationalist Mr Modi, who earlier this month won a landslide election victory, with his election promises will definitely try to Put Pakistan under Pressure to create the Indian Hegemony, but as India needs Land routes , and energy routes , which are through Pakistan , so may try to Bluff Pakistan , to take as much as he can as they have done in the case of Building the dams in Indian Held Kashmir , and controlling the Water Resources of Pakistan , and even in some cases , Making a Large amount of Pakistani Land Barren , as two of Pakistan’s River have already been Dried up , Due to these Dams and the Worst of all Now India even Control the Floods in Pakistan , by Just Opening the Spill over Gates of these Dams , as and when they want to save them selves , or Put Pakistan under Pressure . While Mr Sharif who is working every thing in the favour of their Sponsors , who have brought them to the Powers , after an Interval of 22 years , As the Negotiations with the Taliban Terrorist are done on the advice of their Saudi Sponsors , while the Tilt toward the India is being dictated on the orders of the US sponsors , Who have Planned to make India a Regional Power , so they can even counter the Chinese Threat ,which is a Bigger Problem for them . While the Relationship of India is even not very Pleasant with their Chinese Neighbors , as they even have a War with this Neighbor also in the Past . 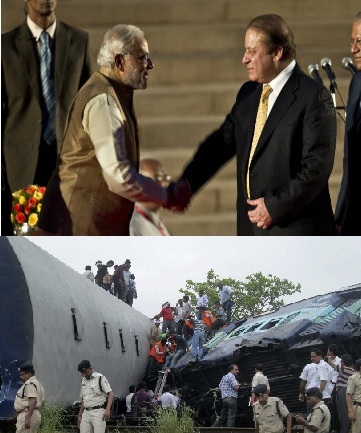 This entry was posted in Asia Pacific, Pakistan News and tagged Diplomacy, india, Narendra Modi, Nawaz Sharif, nawaz shariff, pakistan, Train Collision. Bookmark the permalink.